This week the Environmental Investigation Agency hosted a night of eco-crime awareness against a backdrop of artwork at the annual exhibition of the Society of Wildlife Artists. A pair of violinists elegantly serenaded patrons, supporters and campaigners who mingled and chatted while sipping wine, necking neat rectangular cut sandwiches and wishing they could afford one of the fabulous paintings or sculptures on display (we were particularly fond of the birds, bears and badgers dotted around but maybe we're just susceptible to alliteration). In contrast to the civilised gathering, EIA’s message is that eco-crime supports a savage and lucrative black market business, ranging from million dollar shipments of ivory and banned CFC chemicals, to illegal logging and the trafficking of endangered wildlife. Eco-crime is escalating. 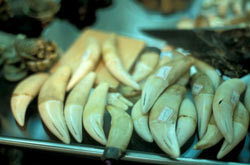 Even though London is geographically remote from wild tigers, whale hunts and deforestation, it’s a thriving market place for illegally sourced tropical hardwood and wildlife products, innocently displayed in alternative medicine centres, antique shops, DIY stores, and bespoke rug vendors. Find out more about the work of EIA by visiting their website. The Society of Wildlife Artists annual exhibition is on till Sunday at the Mall Galleries. Admission just £2.50.